Home » Muddy political waters - Where did Yemen’s war go wrong? What a difference a year make … Indeed! For well over a year now (May 2016) Yemen has suffered Saudi Arabia relentless military onslaught, all in the name of restoration, counter-terrorism, democracy-building and the ever elusive mirage which has been political stability. As bombs have dropped, and craters have formed Yemen we have been told, has bled to be better reborn. Yemen is not drinking the cool aid … ok this statement does not exactly reflect reality. Most Yemenis – safe from those whose pockets happen to have aligned with Riyadh’s immediate interests, have not bought into the political manipulation. Yemenis are not exactly stupid you see- for all their lack of Western sophistication, Yemenis are acutely aware of the geopolitical games which are being played around them. Not only are they aware, but they are pushing back. I hate to break it to you but Yemen is not an old western movie … Yemen is not waiting for the prodigal “white man” to come and save it from itself. Yemen needs no foreign patronage or foreign influence. Yemen is perfectly capable of finding its way! Yemen actually did find its way, which is exactly why Riyadh felt compelled to drop its lead on the impoverished nation. But no matter ... Yemen will find its way back; it will reclaim its right to political self-governance and its sovereign territorial right. Yemenis will push, and push until Yemen stand free once more. Yemenis have been pushing back for quite some time too … it is really the press which has failed in its honest and true reporting of Yemen. If the media had in fact done their job and spoke truths to their readers, your understanding of Yemen’s war would be much different indeed. So different I will venture to say, that you would have most likely called the Houthis and the Resistance the group came to embody, not Yemen’s rebels, but Yemen’s Freedom Fighters – note the capital letters I used. While I remain under no illusion that the Houthis have still a long way to go when it comes to political maturity - Rome was not built in a day – the group successfully created unity where before there was disunity. For a country such as Yemen where disagreements are a national sport, achieving political pluralism, while preserving cohesion is a wondrous feat - never mind in a time of war. Regardless of their many failures, the Houthis have nevertheless proved they are capable of leadership. Not many tribal factions can claim to have withstood the wrath of several military superpowers for well over a year, while battling a devastating humanitarian blockade. I hope for one that Yemen will remember how the Houthis taught Yemen to breath freedom in the face of tyranny. I hope that a people will remember those heroes who awaken Yemen’s spirit, so that a nation could once more remember its name. For now, let us go back to the politics of this war on the Yemen. Let me begin by saying – writing – that Yemen’s war took a turn Saudi Arabia most certainly did not expect. In all fairness I don’t think that anyone could have expected that Riyadh would unleash its mercenary armies onto Southern Arabia to prevent the rise of a democratic Yemen. It is most likely the death of King Abdullah in early 2015 which sealed Yemen’s fate … and maybe that of the kingdom as well. It is often that empires and hegemons are brought down not by powers greater than themselves, but the courage of a few unsuspecting men. In this story, the Houthis could the David to Saudi Arabia’s Goliath. Time will tell I suppose! While war broke out in late March 2o15, its fires were lit up long before that … You witnessed its first spark in 2011, when on the wake of Egypt’s revolution, Yemen dreamt itself free from President Ali Abdullah Saleh. Actually this is not exactly how Yemen’s walked itself to political freedom – this is how you were TOLD Yemen walked itself to democracy. If Egyptians chanted for the departure of their despot: President Husne Mubarak, Yemenis only ever called for reforms … at least in the beginning, when the “revolutionary movement” was still organic and truly popular in its nature. It was foreign powers which engineered popular anger into a political weapon, so that Saleh’s regime would fall. President Saleh you see had outlived its sell-by date and had become somewhat irrelevant. When I say Saleh’s regime, I mean the entirety of his regime – including the so-called Opposition. Allow me to elaborate – bear in mind that I will cut corners to summarize Yemen’s political set up. Many books could be written on Yemen politicking! So … back in 2011 Yemen’s political, military and tribal political structure was divided in between two juggernauts: the General People’s Congress (al-Motamar aka President Saleh’s political faction) and al-Islah which acted an umbrella for various right-wing Islamic groups: including the now notorious Muslim Brotherhood, and tribal leaders close to Riyadh’s Wahhabi clergy. I you recall I previously explained how al-Islah’s rise to power correspond almost exactly to the Houthis state-organized persecution, and Yemen’s Secession war in 1994. While the Houthis did not yet represent a military threat in that they were just a tribe of northern Yemen, it is their Zaidism, their determination to remain true to Yemen’s religious tradition and their rejection of Wahhabism which prompted Riyadh’s wrath. Al-Islah was always meant as a buffer against both President Saleh’s power and Zaidism. Headed by al-Ahmar’s tribe, al-Islah became an extension of Riyadh’s power in Yemen, the contender in many ways to President Saleh’s own tribe, and own family. While Saleh appointed his own family members to Yemen’s key military and political positions, he still had to accommodate al-Islah and offer its leadership a share of the political pie. 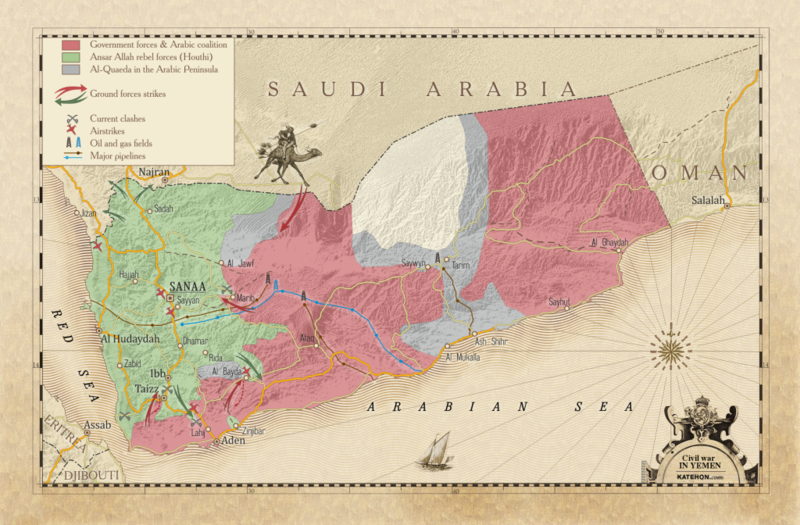 As the decades rolled in, Yemen came to be governed by both al-Ahmar, and the Saleh. Smack down in the middle was Yemen. Yemen 2011 uprising came to upset this balance of power. Yemen uprising was engineered to upset this balance of power, so that a new one could rise. If Yemen’s political awakening came as a surprise to both the Saudis and the Americans, it also offered an opportunity neither could pass on. It is often from chaos that new order can be shaped and moulded to existence. 2011 was meant to introduce a new order to Southern Arabia … If not for the arrival of the Houthis, Riyadh would have succeeded in bringing Yemen to kneel to its imperial will. But why would Riyadh want President Saleh gone when its officials did everything they could to protect him? Good question! Did they though …. Who did they protect? The man, or the power he represented? You see while Riyadh might have cared little for Saleh’s life, he was still the guardian of a legitimacy the kingdom could not accept to see threaten. More importantly President Saleh had been earmarked to transition Yemen into Riyadh’s hands – Saudi Arabia understood only too well how quickly Yemen could have fallen into real chaos if not for a strong hand to hold it together. Chaos was only allowed if directed properly. While I will not claim to have been privy to Riyadh’s political whispers, I will venture a theory on why Riyadh wanted to see Saleh gone. It wasn’t so much President Saleh who represented a threat but his appointed successor: General Ahmed Ali Abdullah Saleh - the president’s eldest son and head of the now-debunked Republican Guards. A central military figure, Gen. Ahmed Saleh was … and still is, a well-loved figure. Not only that but the man stands for a Yemen, millions would like to see manifest. If the general is very much his father’s son in that he understands the inner and outer politics of Yemen, he is also a modern educated man who wants to see his country reclaim its leading position in Southern Arabia. Where President Saleh was in many ways a tribesman turned president, Gen. Ahmed Saleh is a military man ambitioning to turn Yemen into Arabia’s first functioning republic by taming both tribalism and Wahhabism. Needless to say that the kingdom had an issue with that. Not only does Riyadh want to perpetuate Yemen’s tribalism, since it allows for greater control, but it also wants to see Wahhabism becomes Yemen’s state religion. The general’s accession to the presidency would make all the above impossible – hence his fall from political and military grace. General Saleh is now under house arrest in the UAE … Remember that detail because it is awfully important. Before his ouster from power in 2012 President Saleh appointed his son: Ambassador to the UAE. While the move might have looked a little strange … how could one go from ruling over Yemen’s military elite to an obscure office abroad! It actually betrays President Saleh’s political intelligence. Do not underestimate this one man’s ability to manipulate his way back to the heights of power … many have done in the past and all are nursing their bruises. How and why you may ask. The how has yet to be written, but here is the why: because Gen. Saleh has many friends! Because Gen Saleh has a powerful friend in the UAE and in the United States of America still. He shares a deep aversion for the Muslim Brotherhood with the UAE … he shares an understanding of radicalism with the US, and he bears no hatred vis a vis Iran. All these qualities make him a natural candidate for the presidency! Let’s not fool ourselves and believe that presidents are chosen by the people. Presidents are made, not elected. In the case of Gen. Saleh though it could be different – his presidency would be popular! Millions of Yemenis would not mind having a strong, experienced military man hold the reins of power. His appointment as Ambassador to the UAE was not a fluke – it was a strategy. As President Saleh allied himself to the Resistance to oust Saudi Arabia from Yemen, his son awaits patiently for the winds to turn. In their eagerness to wage war to regain control, al-Saud Royals might have precipitated Yemen liberation. If not for Riyadh’s betrayal of President Saleh, and its backing of al-Islah/Muslim Brotherhood – which move profoundly angered the UAE, Yemen’s former strongman might not have rebuilt his bridges with the Houthis, and risen a giant of a Resistance movement. Talk about a wrong move ….